All those who are hungry come and eat, all those in need, come and share in the Passover Seder (Passover Haggadah). Help us bring the words from our Passover Seder to life with some of the most important hunger advocates around Atlanta by joining us at our annual Hunger Seder. 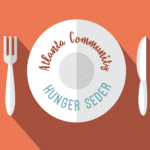 Sponsored by AA Synagogue and Atlanta JCRC (Jewish Community Relations Council), the Hunger Seder weaves the theme of hunger and food insecurity into a Passover Seder experience. A delicious feast and empowered conversation will inspire us to take the word of our tradition, and turn them directly into action by delivering our leftovers downtown, directly into the hands of those in need. To join the planning committee, contact Rabbi Laurence Rosenthal at lrosenthal@aasynagogue.org or 404.603.5744.